Over the past month, I have made and frozen dozens of cookies. This weekend I pulled out all of the cookies to put together cookie plates for neighbors and friends but I quickly realized that I was short cookies. Looks like my husband and I may have stolen too many cookies out of the freezer! I had a day to come up with something else to deliver to friends. 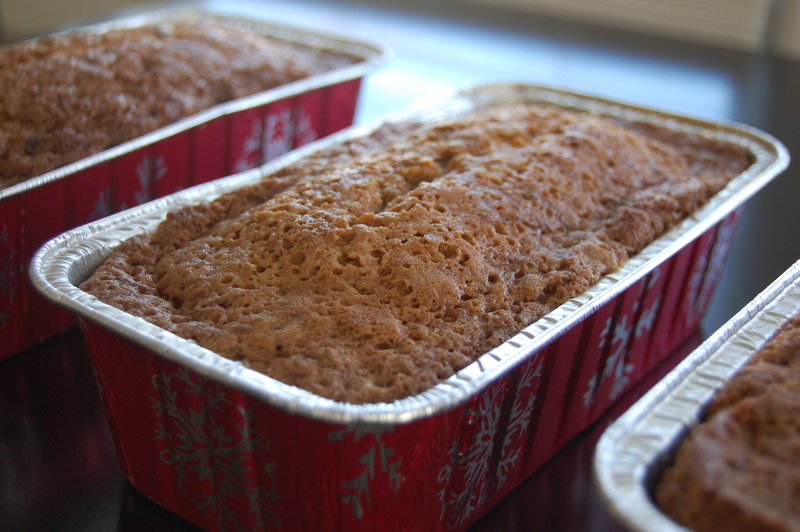 I pulled out my favorite Chocolate Chip Zucchini Bread recipe and purchased disposable holiday tins from Michaels. They came together so quickly and were the perfect gift. Need a last minute gift? Try making your favorite recipe and find a creative way to package it. Everyone loves to receive something homemade. Our Michael’s had ceramic loaf pans for $1.00 each–they were actually cheaper than the disposable ones!